The decision of which of these tools to use for my system was influenced by a number of factors. Firstly I’ll explain why I decided to use Maven as the build tool (shock!!). I’m a big fan of Ant, I’d usually choose it (or probably Gradle now) over Maven any day of the week, but there was already an existing Ant build system in place, which had grown a bit monolithic (that’s my polite way of saying it was a huge mess), so I didn’t want to go there! And besides, the first project that would be going into the new continuous delivery system was a simple Java project – way too straightforward to justify rewriting the whole ant system from scratch and improving it, so I went for Maven. Furthermore, since the project was (from a build perspective) fairly straightforward, I thought Maven could handle it without too much bother. I’ve used Maven before, so I’ve had my run-ins with it, and I know how hard it can be if you want to do anything outside of “The Maven Way”. But, as I said, the project I was working on seemed pretty simple so Maven got the nod. GO was the latest and greatest C.I. server in use, and the CruiseControl systems were a bit of a handful already, so I went for GO (also I’d never used it before so I thought that would be cool, and it’s from Thoughtworks Studios, so I thought it might be pretty good). I particularly liked the pipeline feature it has, and the way it manages each of its own agents. A colleague of mine, Andy Berry, had already done quite a bit of work on the GO C.I. system, so there was already something to start from. I would have gone for Jenkins had there not already been a considerable investment in GO by the company prior to my arrival. I decided to use Artifactory as the artifact repository manager, simply because there was already an instance installed, and it was sort-of already setup. The existing build system didn’t really use it, as most artifacts/dependencies were served from network shares. I would have considered Nexus if Artifactory wasn’t already installed. I setup Sonar to act as a build analysis/reporting tool, because we were starting with a Java project. I really like what Sonar does, I think the information it presents can be used very effectively. Most of all I just like the way in which it delivers the information. The Maven site plugin can produce pretty much all of the information that Sonar does, but I think the way Sonar presents the information is far superior – more on this later. Perforce was the incumbent source control system, and so it was a no-brainer to carry on with that. In fact, changing the SC system wasn’t ever in question. That said, I would have chosen Subversion if this was an option, just because it’s so utterly freeeeeeee!!! That was about it for the tools I wanted to use. It was up to the rest of the project team to determine which tools to use for testing and developing. All that I needed for the system I was setting up was a distinction between the Unit Tests, Acceptance Tests and Integration Tests. In the end, the team went with Junit, Mockito and a couple of in-house apps to take care of the testing. The Maven Build, and the Joys of the Release Plugin! If they all pass we run a bunch of static analysis and produce pretty reports and eventually deploy the candidate to a “Release Candidate” repository where QA and other like-minded people can look at it, prod it, and eventually give it a seal of approval. Maven isn’t exactly fantastic at fitting in to the pipeline process. 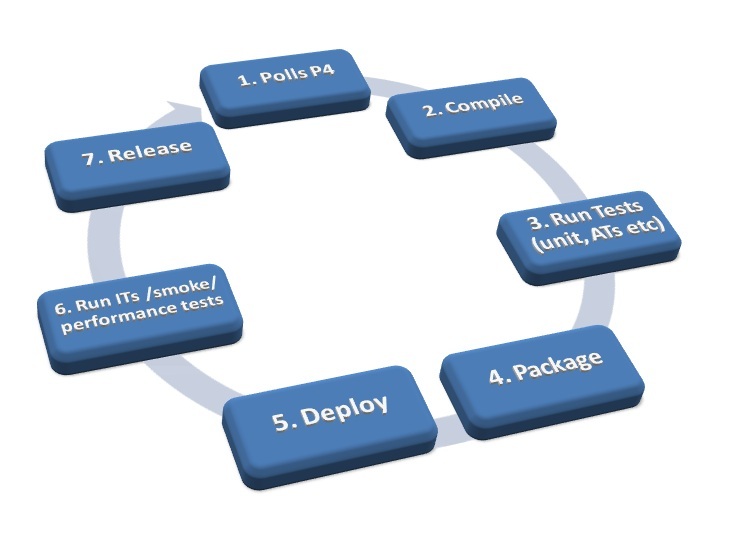 For starters we’re running multiple test phases, and Maven follows a “lifecycle” process, meaning that every time you call a particular pipeline phase, it runs all the preceding phases again. Our pipeline needs to run the maven Surefire plugin twice, because that’s the plugin we use to execute our different tests. The first time we run it, we want to execute all the unit tests. The second time we run it we want to execute the acceptance tests – but we don’t want it to run the unit tests again, obviously. This will run the Unit Tests implicitly and also check the coverage! This will again run the Surefire plugin, but this time it will run through the test phase (thus executing the unit tests again) and then execute the integration-test phase, which actually runs our acceptance tests. You’ll notice that we’ve run the unit tests twice now, and this is a problem. Or is it? Well actually no it isn’t, not for me anyway. One of the reasons why the pipeline is broken down into sections is to allow us to separate different tasks according to their purpose. My Unit Tests are meant to run very quickly (less than 3 minutes ideally, they actually take 15 seconds on this particular project) so that if they fail, I know about it asap, and I don’t have to wait around for a lifetime before I can either continue checking in, or start fixing the failed tests. 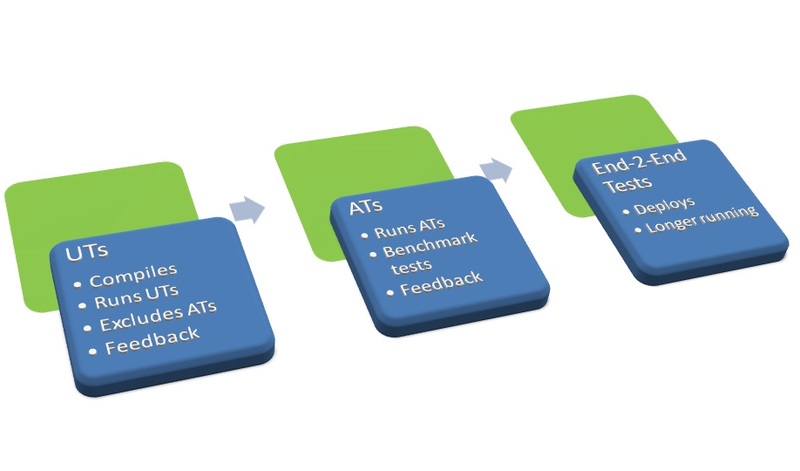 So my unit test pipeline phase needs to be quick, but what difference does an extra few seconds mean for my Acceptance Tests? Not too much to be honest, so I’m actually not too fussed about the unit tests running for a second time. If it was a problem, I would of course have to somehow skip the unit tests, but only in the test phase on the second run. This is doable, but not very easy. The best way I’ve thought of is to exclude the tests using SkipTests, which actually just skips the execution of the surefire plugin, and then run your acceptance tests using a different plugin (the Antrun plugin for instance). This does the same as it did before, because the integration-test phase is implicit and is executed on the way to reaching the “deploy” phase as part of the maven lifecycle, but of course it does more than it did before, it actually deploys the artifact to the C.I. repository. One thing that is worth noting here is that I’m not using the maven release plugin, and that’s because it’s not very well suited to continuous delivery, as I’ve noted here. The main problem is that the release plugin will increment the build number in the pom and check it in, which will in turn kick off another build, and if every build is doing this, then you’ll have an infinitely building loop. Maven declares builds as either a “release build” which uses the release plugin, or a SNAPSHOT build, which is basically anything else. But I want to create releases out of SNAPSHOT builds, but I don’t want them to be called SNAPSHOT builds, because they’re releases! So what I need to do is simply remove the word SNAPSHOT from my pom. Get rid of it entirely. This will now build a normal “snapshot” build, but not add the SNAPSHOT label, and since we’re not running the release plugin, that’s fine (WARNING: if you try removing the word snapshot from your pom and then try to run a release build using the release plugin, it’ll fail). So we have a jar, and it’s in our “ci” repo, and we have a code coverage report. But where’s the rest of our static analysis? The build should report a lot more than just the code coverage. What about coding styles & standards, rules violations, potential defect hot spots, copy and pasted code etc and so forth??? Thankfully, there’s a great tool which collects all this information for us, and it’s called Sonar. I won’t go into detail about how to setup and install Sonar, because I’ve already detailed it here. So that’s exactly what we’ll do in the next section of our build pipeline. As you can see, Sonar produces a wealth of useful information which we can pour over and discuss in our daily stand-ups. As a rule we try to fix any “critical” rule violations, and keep the unit test coverage percentage up in the 90s (where appropriate). Some people might argue that unit test coverage isn’t a valuable metric, but bear in mind that Sonar allows you to exclude certain files and directories from your analysis, so that you’re only measuring the unit test coverage of the code you want to have covered by unit tests. For me, this makes it a valuable metric. Once this phase completes successfully, we know we’ve got a half decent looking build! At this point I’m going to throw a bit of a spanner into the works. The QA team want to perform some manual exploratory tests on the build. Good idea! But how does that fit in with our Continuous Delivery model? Well, what I did was to create a separate “Release Candidate” (RC) repository, also known as a QA repo. Builds that pass the IT stage get promoted to the RC repo, and from there the QA team can take them and do their exploratory testing. Does this stop us from practicing “Continuous Delivery”? Well, not really. In my opinion, Continuous Delivery is more about making sure that every build creates a potentially releasable artifact, rather that making every build actually deploy an artifact to production – that’s Continuous Deployment. Our final stage in the deployment pipeline is to deploy our build to a performance test environment, and execute some load tests. Once this stage completes we deploy our build to the Release Repository, as it’s all signed off and ready to handover to customers. At this point there’s a manual decision gate, which in reality is a button in my CI system. At this point, only the product owner or some such responsible person, can decide whether or not to actually release this build into the wild. They may decide not to, simply because they don’t feel that the changes included in this build are particularly worth deploying. On the other hand, they may decide to release it, and to do this they simply click the button. What does the button do? Well, it simply copies the build to the “downloads” repository, from where a link is served and sent to customers, informing them that a new release is available – that’s just the way things are done here. In a hosted environment (like a web-based company), this button-press could initiate the deploy script to deploy this build to the production environment. And that just about covers it. I hope this is useful to some people, especially those who are using Maven and are struggling with the release plugin!